CairnsBlog.net: A Council approved what? 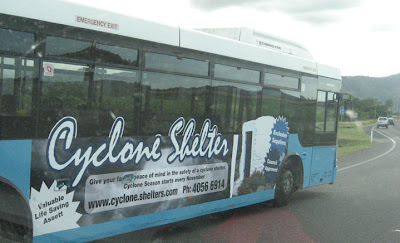 According to a Kewarra Beach resident who snapped this wee gem on the way home today, there's a Council approved cyclone shelter on the market to "give your family peace of mind in the safety of a cyclone shelter." Maker Markus Rogers of Gordonvale says his business is about saving lives, and for around $9,000 you can have one of these delivered to your back yard. "Surviving a cyclone is easy. You must prepare now so you are not at a disadvantage when a cyclone appears," says Markus. "My aim is to increase public awareness with information and education, about cyclone preparedness."